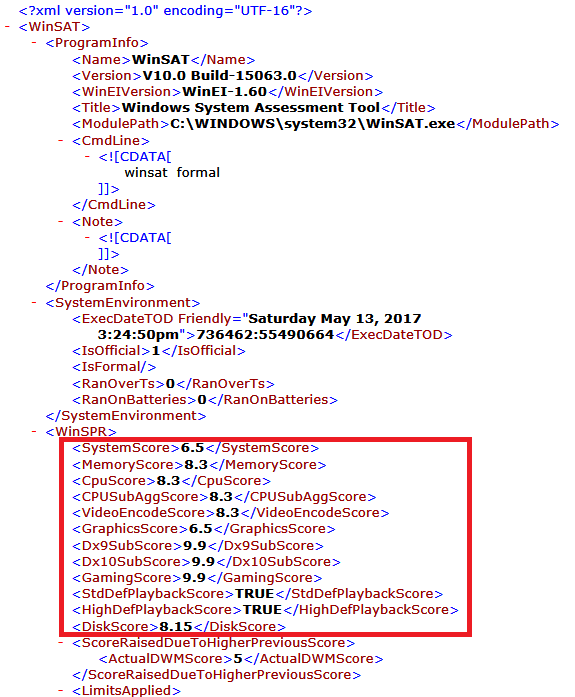 The Windows Experience Index (WEI) is a rating system that measures the various parts of your computer that affect performance. The WEI includes five subscores: processor, memory, 2D graphics, 3D graphics, and disk; the basescore is equal to the lowest of the subscores and is not an average of the subscores. Understanding the Index can help you sort out what actions to take to speed up your PC. Microsoft introduced the Windows Experience Index with Windows Vista and it was an inbuilt benchmarking tool built inside Windows OS to provide a score of your hardware combination and how well they work. The basic idea from Microsoft for WEI was that when you go out and buy a new software for your PC, you could buy the one which corresponded to your Windows Experience Index score to get the best performance. Though this idea didn’t catch on, but people still used WEI score to compare how well their PC performed. It was also hoped that WEI would serve as a universal, easy-to-understand way for software developers to communicate system requirements. The Windows Experience Index feature basically rates your PC on five key components: Processor, Memory (RAM), Graphics, Gaming graphics, and primary hard disk. Each piece of these five key hardware in your PC gets its own score called a subscore. Since the system’s overall performance is only as strong as its weakest component, the base score is not an average, rather it is determined by the weakest subscore. For years, the Windows Experience Index (WEI) has been an easy way to determine merely how powerful your PC really is. For consumers who don’t know how to benchmark a machine, the WEI allowed them to see just how their PC stacked up against other computers on the market. WEI never caught on, and there are probably several reasons for that. For one, the score, tucked away in the System properties window, wasn't easy to find — at least not for the non-technical users it was primarily aimed at. In Windows 8.1, Microsoft removed the Windows Experience Index (WEI) feature. Earlier, it could be found in System Properties, but it is not present there any more. In Windows 10, it is missing too, although it’s still hidden deep within the system to be used by savvy web users. If you love the feature and you are interested in knowing what is your Windows Experience Index, here is how you can view it quickly in Windows 10. This tricks works in Windows 8.1 too. We have few methods. Step 2: Locate the file titled Formal.Assessment (Initial).WinSAT and double-click on the file (if you have multiple files, please open the latest one) to open up the XML file in your default web browser. 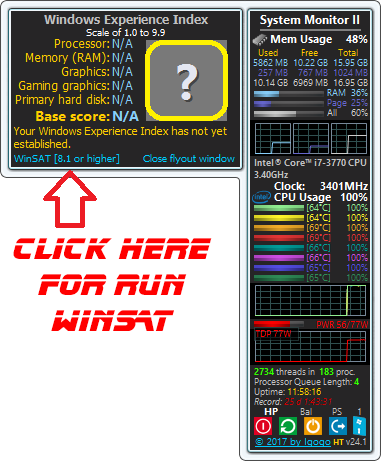 Step 3: Once the file is opened in the web browser, you can view the date on which the file was generated, and also the score for your hardware, such as system score (base score), memory score (RAM score), CPU score, graphics score, disk score, and gaming score (gaming graphics). 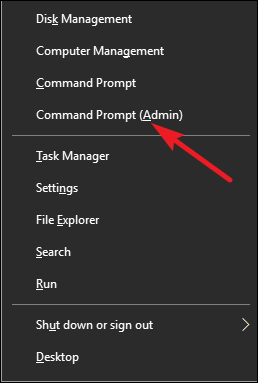 Step 1: Open Command Prompt as administrator. To do this, right-click on the start icon. This will start the benchmarking operation. Do not use the computer until the computer finishes generating the report. This might take a few minutes. 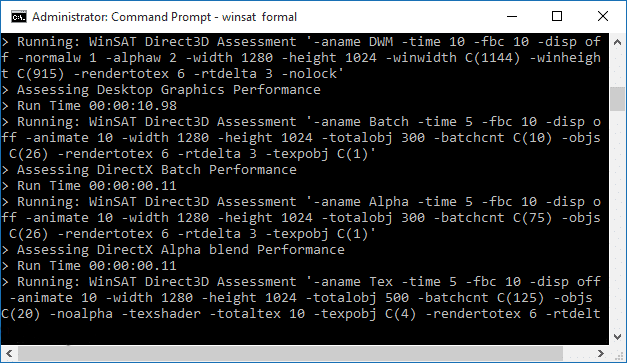 Step 4: Double-click on the file titled <date.time>.Formal.Assessment (Initial).WinSAT.XML to open it with the default web browser. 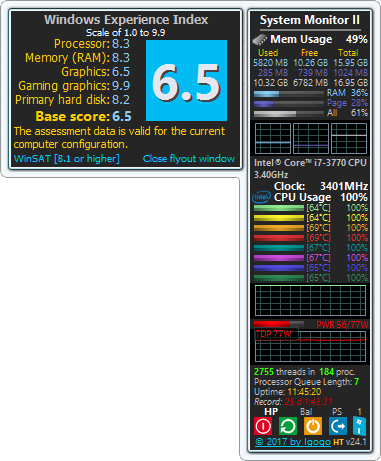 Step 5: Once the file is opened in the web browser, you can view the system score (base score), memory score (RAM score), CPU score, graphics score, disk score and gaming score (gaming graphics). If above too complex you can use my System Monitor II gadget to do all of these. Your system may take a couple of minutes to re-run all assessments After finish go to fly-out again and see your system score.